Hakusan, Japan, June 15, 2017 – EIZO Corporation (TSE: 6737) today announced the introduction of a new line of surgical monitors for displaying endoscopy and operating microscope feeds. 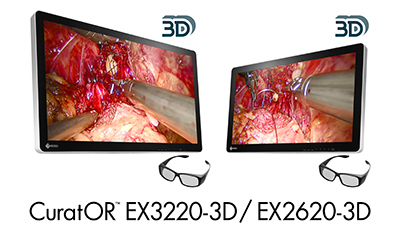 The first two models are the CuratOR EX3220-3D and EX2620-3D – 31.5-inch and 26-inch full HD (1920 x 1080) surgical monitors implementing EIZO’s first 3D imaging technology. In July 2016, EIZO acquired Panasonic Healthcare Co., Ltd.’s surgical and endoscopic monitor business. EIZO has developed its own advanced surgical monitors that combine the technologies of both companies in this new line of products. 3D technology has revolutionized work in the operating room, allowing surgical teams to view organs and tissue structures with a natural-looking 3D effect. With EIZO’s new innovative 3D technology, these monitors assist surgeons in today’s sophisticated medical procedures. The EX3220-3D and EX2620-3D faithfully reproduce 3D images with high definition, brightness and contrast. The EX3220-3D has a maximum brightness of 650 cd/m2 and a contrast ratio of 1400:1, and the EX2620-3D has a maximum brightness of 580 cd/m2 and a contrast ratio of 1400:1. Due to the way monitors are built, many have an air gap between the LCD panel and outer layer of protective glass which creates reflections due to differences in refractive indices. However the EX3220-3D and EX2620-3D offer EIZO’s own optical bonding which fills the gap with resin, reducing reflections and improving visibility and durability. Additionally, the monitors are designed with safety and hygiene in mind. They feature rounded corners to prevent injury when moving monitors around the operating room, and they also feature a fully flat design which is dustproof and waterproof (Front: IP45; Whole Monitor: IP32). Furthermore, because they are fan-less, there are no ventilation holes, meaning that cleaning and disinfection can be done safely and efficiently without damaging the monitors. They can also contain cables neatly in the supplied cable cover for safe and hygienic use. EIZO will continue to expand on this new line of surgical monitors with varying resolutions and sizes such as 4K3D, to respond to the diversifying needs of the healthcare industry. The CuratOR EX3220-3D will begin shipping in December, 2017. The CuratOR EX2620-3D will begin shipping in September, 2017. Date of availability varies by country so contact the EIZO group company or distributor in your country for details.